Arlene Foster has dismissed evidence that the minuting of official Stormont meetings was halted to prevent their release under Freedom of Information (FoI) law. 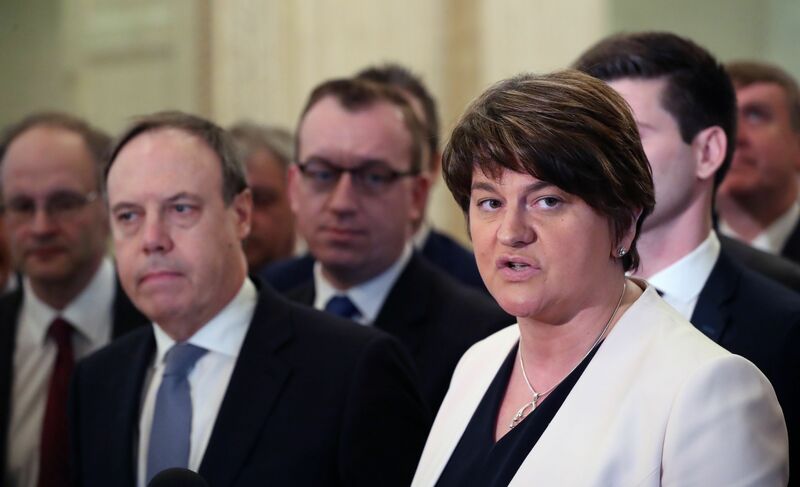 The lack of records was “shocking” and worrying but concern over transparency legislation and related political sensitivities did not influence that, the DUP leader added. Head of the Northern Ireland Civil Service David Sterling has said minute-taking lapsed after devolution and suggested the main parties in the devolved power-sharing administration in Belfast were sensitive to criticism. Former enterprise minister Mrs Foster was in charge of planning of the botched green energy scheme in 2012 and told the Renewable Heat Incentive (RHI) public inquiry she was unaware notes had not been taken. Mrs Foster noted the development of policy was exempt from FoI, although not decision making. She asked why the RHI scheme would have been contentious when the DUP’s former partners in Government Sinn Fein were part of its introduction. A series of fatal design flaws exposed Stormont to a huge overspend, paying out more than it cost to buy wood fuel. This created an incentive to “burn to earn”. The problems prompted the collapse of devolution at Stormont. When powersharing was introduced in 2007 there was more contact between ministers and officials, the RHI public inquiry chaired by Sir Patrick Coghlin has been told. Mr Sterling has previously told the inquiry ministers liked to have a “safe space where they could think the unthinkable and not necessarily have it all recorded”. The DUP leader said: “I don’t think there are any politicians that are not sensitive to criticism, given what I came through last year I think I am probably tougher than most. “All politicians know that they are going to be criticised on a day and daily basis. “None of us took decisions to avoid criticism. Politics is about not just getting elected, it is about doing something with your mandate and to deliver on what you want to deliver on. “That is why I got involved in politics, to try to make a difference to Northern Ireland. Earlier, she said she did not sign a blank cheque for the RHI scheme but officials should have given her more information before a key decision. The DUP leader said she did not read some technical information associated with the scheme but it was up to others to flag up issues raised by that in their submissions to her.